I seem to be going through some kind of “spring cleaning” phase. I have already started de-cluttering and simplifying a couple of weeks ago. This week I have continued that process. I have officially been through every single item in my apartment, from paper to clothes, to dvds, cds, and old VHS tapes, to dishes, nik nacs. Everything! I have gotten rid of a lot. The ultimate goal would be to have only things I use. However, there are just some things that are sentimental that I don’t use, but want to keep. 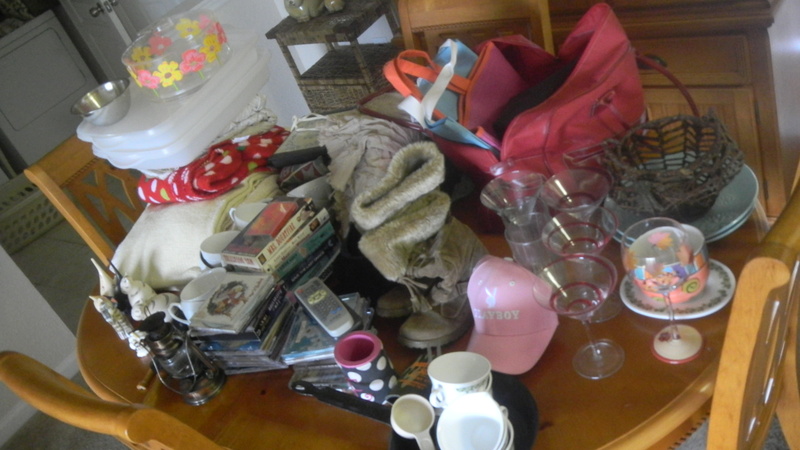 This pile was donated to the dumpster diggers (except for the boots, bags, and clothes, they go to the consignment shop). Really it wasn’t even unloaded yet when a woman drove by and filled her truck. I was glad someone else could use it. Hopefully it isn’t just sitting in a hoarder’s pile somewhere. So far so good. I have been trying to eat whole foods, drink tons of water, and avoid sugar, alcohol, and processed foods. I feel pretty good. I feel peaceful, happy and ready to MOVE!! !